A new bench just found a new home. It’s always nice to finish up a project. Now is when the shop time pays off and the new piece can begin to find its way in the world. After spending so much care and effort achieving the look and finish I want, its now time for this bench to start to live. For a piece of furniture that means getting put to work. A piece of furniture that works will get used, and not always the way it was intended. The proud new owner may hop up on this bench to change a light bulb, or maybe use it on its side to barricade in the new puppy. Who knows. All this use comes with a price, though I couldn’t put a price on it. The dings, scuffs, scratches and assorted wounds that it will pick up begin to tell the story of a life lived. It also creates a beautiful patina that would be impossible to replicate. It my mind it increases the value because it now embodies the memories and stories of a life lived. 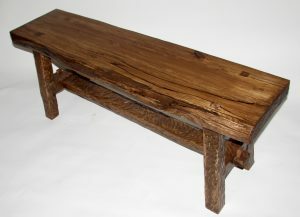 This piece was created as an entry bench for a new home. A place to sit down, put your boots on and prepare for what awaits out in the world. It was built using spalted birch. 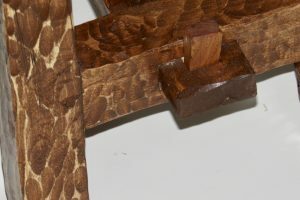 Mortice and tenon joinery was used throughout, with wedged tenons for the legs and stretcher.